Is this really the End for Batman? 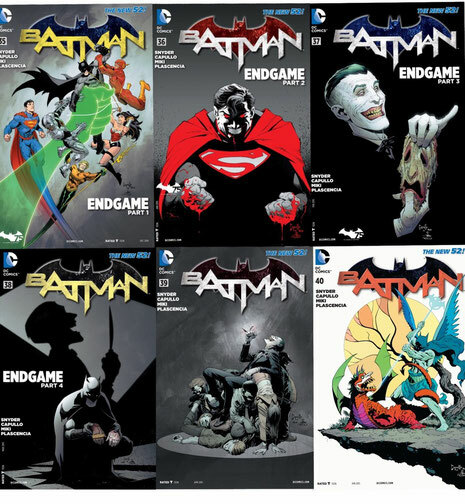 The Batman: Endgame series is comprised of New 52 Batman issues number 35 through 40, and represents Scott Snyder’s and Greg Capullo’s second Batman story arc featuring the Clown Prince of Crime, the Joker. When we last saw the Joker in the excellent Death of the Family story arc, he had fallen off a cliff into the abyss, and to his ‘presumed’ death. Of course, in comic books, no main character ever really dies, or stays dead forever. It was only a matter of time before the Joker reappeared to wreak havoc upon the Caped Crusader and the citizens of Gotham City. What fans may not have expected is for the Joker to reappear with a completely healed face, since when we last saw him in the aforementioned series, he was wearing his original face as a mask. When Endgame starts, Batman finds himself in a confrontation against some of the fellow founding members of the Justice League including, Superman, Wonder Woman, Aquaman, and The Flash (Green Lantern and Cyborg are on the cover of issue #1, but were omitted from the story). Apparently, the League members are victims of chemically induced hypnotic persuasion, and it is only a matter of time before the world’s greatest detective, Batman, figures out who is behind their current state. This opening superhero battle scene starts the Endgame series off with a bang, and gives comic book fans another Batman versus Superman battle. Where Scott Snyder excels, as a writer, is in his ability to craft a well-developed and intelligent story, which is full of thrills, uncertainty, tension, and twists. Snyder does a great job with building a continuity between the Batman story arcs, as events from The Court of Owls to The City of Owls to Death of the Family to Zero Year, have impacted each of the stories’ characters going forward into the subsequent series. Because a strong series continuity has been established, there are very few wasted experiences in any of the New 52 Batman comic book issues, and there always seems to be something at stake. With Endgame, a true sense of peril is produced, where you really don’t know if Batman, or any of the other major characters will survive the current issue. If the characters happen to survive, then not only will he or she carry physical scars for the rest of his or her life, but the story’s events will undoubtedly take a significant mental toll on the character going forward. Snyder is not afraid to take risks with the Batman characters, and take the characters in new directions, physically and psychologically. You will see the normally strong-willed and level-headed Batman get more than a little off-kilter and hit new lows in this series. Also, a classic, beloved member of the Bat-family will suffer a major physical injury for which there is no recovery. Fortunately for readers, the risks Snyder took have paid off significantly, and each issue of the Batman: Endgame series has been entertaining and captivating from cover-to-cover. Up until Endgame, very little was known of the Joker’s past. This story uses creative and terrifying imagery to delve more into the character’s mysterious past, which seems to extend more than a century into Gotham’s early days. Readers will question whether the clues revealed about the Joker’s past were part of another one of his elaborate and twisted schemes to get inside Batman’s head, or if the Joker could really be an immortal, supernatural being. The latter would explain how he continually cheats death, and how he has recently reappeared with his original face intact, but when it is all said and done, readers are left wondering. Snyder’s take on the Joker is more horrific and terrifying than any previous comic book interpretation that I can remember. Throughout this series, the Joker not only seems to always be one step ahead of Batman psychologically, but is now more than a match for him physically. The previous forces Batman to break character and reluctantly seek the assistance from long time foes in order to save Gotham City, and the latter leads to a classic and bloody final battle between the two at the conclusion of the series. This showdown provides a worthy conclusion to an excellent story arc, and provides readers with one of the all-time great Batman versus Joker moments. As physically intense as this showdown was, it also added an emotional touch to the series’ conclusion. Without going into spoiler territory, I will say that this is a series changing battle, that readers shouldn’t expect both men to walk away from. The Batman series will definitely have to go in another direction after this one. The artwork is excellent throughout the series, and seemed to get stronger as the series progressed. In this series, Greg Capullo (complemented Danny Miki’s inking and FCO Plascneia’s coloring) has proven that he is more than capable of handling the visual depth and various nuances of the Batman character. The large scale superhero battle, in the first couple of issues, have the necessary visual quality and detail to drive a grand opening action sequence, and the lower street levels display the level of grit necessary to add a great level of eeriness, drama, and tension to latter scenes. Greg Capullo provides a fitting visual interpretation of the Batman universe, and always finds a way to do so in a unique and refreshing manner. When its all said and done, Greg Capullo may join the likes of Neal Adams, Frank Miller, and Jim Lee as one of the most notable Batman artists in the comic book’s storied history. Due to Scott Snyder’s strong use of continuity to build his story, you may be better served picking up a copy of the Batman: Death of the Family collection to bring you somewhat up to speed before diving into this story. That being said, if you are a Batman fan, or a comic book fan in general, Batman: Endgame should definitely be in your collection. The story is entertaining, the artwork is excellent, and the conclusion is game-changing.